I keep doing the same makeup look lately, it's quick, easy and looks very natural. CHEEKS - Soleil Tan De Chanel, Mac 'Rose Quartz' Mineralised Skin Finish. EYES - Jemma Kidd 'Vintage' e/s, Jemma Kidd 'Earth' pencil eyeliner (upper outer lash line), Mac 'Zoom Fast Lash' mascara. LIPS - L'oreal Cappuccino lipliner, Mac 'On The Scene' Creme Sheen Glass. I LOVE this 'Vintage' shade by Jemma Kidd, it's perfect for an everyday look particularly when in a rush as I apply it with my finger all over the lid and blend it out and that's it. The shade is a cool toned golden champagne which has a beautiful sheen. I was sent it a few months ago and I have got so much use out of it that I had to share it with you. This shade is everything that I wanted Mac 'All that glitters' to be. The texture is very soft, smooth, buttery and highly pigmented, it's almost the same colour as my skin but with the added 'glow' factor. It lasts all day, doesn't crease even without a base and I can't really fault it, I even prefer the texture to Urban Decay eyeshadows. I dropped my e/s on the floor some time ago and it cracked which is why it's in the state that it is, but that hasn't stopped me using it! An added bonus, here's an everyday outfit! 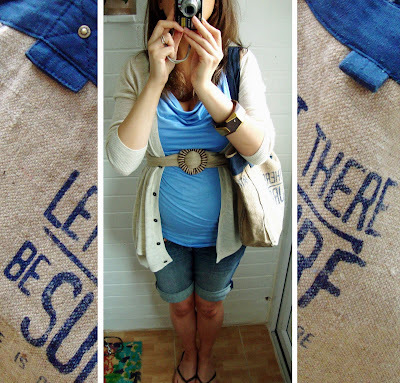 I'm wearing my maternity jean shorts from H&M, a baby blue top also from H&M, a knit cardigan, a very cool belt from 'Sisley' my 'Fat Face' bag, brown flip flops and dark wooden jewellery. 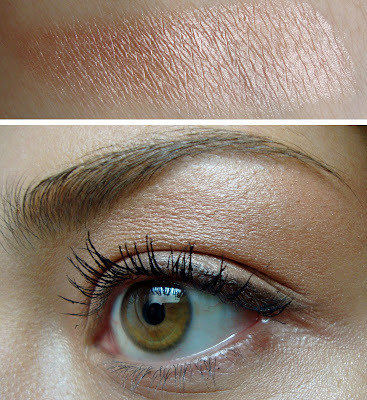 What's your everyday eyeshadow that's your skin colour but with the 'glow' factor? 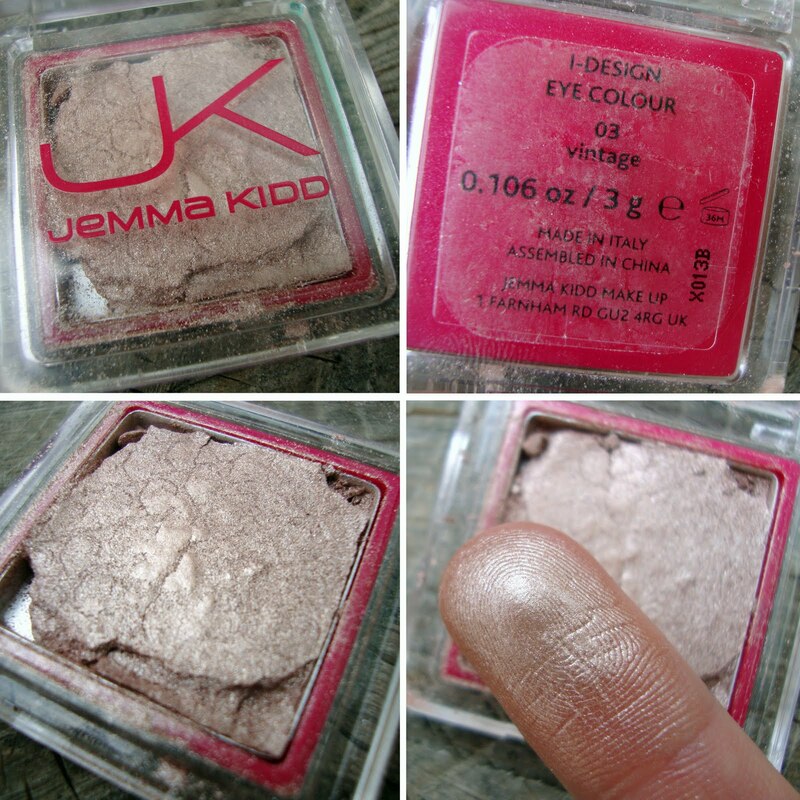 Disclaimer: The 'Jemma Kidd' products were sent for consideration for review, I was not paid for this post and I am not affiliated with the brand. Honest opinion as ALWAYS!!! That look really suits you, it appears so effortless! Mac warming trend is my 'everyday glow'. It's a little more pigmented than my skin tone but really los my whole eye area once I sheer it out. And I know it's a bit boring but, Mac brule always does it for me on a lazy day! That bag is perfect for the Summer! I love MAC's Woodwinked over Indianwood paintpot...it's so simple and easy for everyday. BTW you look gorgeous...as usual! I'm so excited about your baby..you and your husband are so blessed. First of all let me tell you that you look great! My go to eyeshadows are MAC's Naked Lunch and Patina. I wish I looked this good in natural makeup! @fantastic I know, it's amazing :) I can't wait to meet her! Awesome! I have a NYX palette that has a color similar to this.. its my "im not wearing eyeshadow, I just glow" look, haha. The color is very simple and pretty. Hi Muhsine! Come join the the FABB Network on Facebook! We will send out invitations to our fans when we launch the Fashion and Beauty Bloggers Network soon! xoxo the FABB Team!